Description: Q24414 with BNSF 9467 passes Q55313 with CSXT 8860 on the main. Description: BNSF 4441 leads this Q24414 on a cloudy Sunday. Description: Oh my God. A true Executive. Description: DPU's on a southbound loaded coal train through Quanah Texas. Title: MAC Pac ACe Attack!! Title: MAC ACe Belle Battle Royale! Title: ACe At Its Best! Title: And She's Outta Here! Description: BNSF DPU's #6258 And 9467 in Centralia IL. 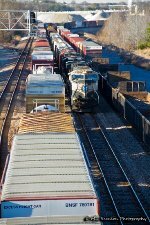 Description: A southbound freight proceeds slowly from Tennessee Yard towards Mississippi.